On 7th May, City University London hosted the UK Magnetics Society’s one-day seminar titled ‘Thermal and Structural Design for Electric Machines and Drives’. 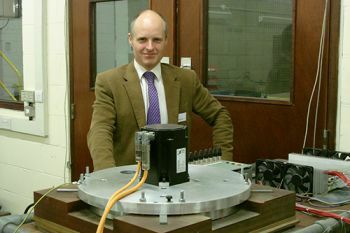 City hosted the UK Magnetics Society's annual one-day seminar, titled 'Thermal and Structural Design for Electric Machines and Drives', on 7th May. The UK Magnetics Society is a leading international Society representing both industrial and academic interests in all spheres of magnetics. Professor of Energy Systems, Professor Keith Pullen, welcomed the 60 speakers and delegates from industry and research-intensive universities attending the seminar. As well as setting the scene for the event in light of the increasing use of electrification in automobiles and aircraft, he gave a short history of City and highlighted the substantial recent investment being made in staff and infrastructure. Professor Pullen also drew attention to the close proximity and advantageous collaboration between Mechanical and Electrical engineering at the University when compared to many institutions in which these two aspects of the discipline are separated by different buildings. Drawing on his experience as a consultant for the successful Mercedes AMG Petronas Formula One team, Professor Pullen mentioned the development of the new 2014 F1 hybrid powertrains as a good example of where efficient and cost-effective electrical machines could be applied to the electrical and mechanical engineering aspects of F1 racing cars. Associate Professor in Engineering Science at Oxford University (and a former PhD student of Professor Pullen), David Howey, gave a talk on the issues around measuring heat transfer within narrow air gaps. At the end of the seminar, the visitors were impressed with their tour of City's newly refurbished engineering laboratories.